First day into Christmas break and we are doing nothing---it's a wonderful nothing. We haven't done nothing in months. We leave for Thailand on Monday to do more of nothing, but on the beach this time. We'll be back on January 5th, just after the Japanese New Year festivities are over. Next year I think I'd like to be in Japan for the new year when they eat noodles, throw beans and go to temples all dressed in Kimono. 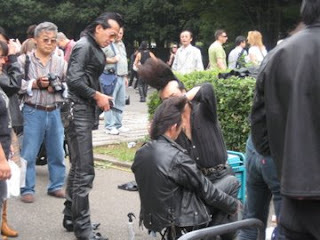 For now, here are a few pictures of Tokyo daily life. I think they give a nice sense of the intensity of the city. Inside a tall building in Futako-Tamagawa, the shopping mall/train station/neighborhood near my house. You can see all of downtown Tokyo from here. A cosmetics/pharamacy shop in Shibuya. Shibuya at Christmas. I'm not a Christmas purist, but there is something about the Japanese celebration of Christmas that seems really hollow to me--it's even more consumer driven than the US. James took this cute pic of the girls at their Choral Night concert. Love it. 900 yen per beer is the going rate for a pint (or smaller). Thats about 10.00 US these days. We had a grueling 3 day teaching workshop on assessment from last Thursday to Saturday that required full working brains. By Saturday night my brain shut off. Thinking our bodies could use a workout after all the mental lifting, we went on a Sunday ride with a group called the Half Fast Cyclists. Its a bunch of gaijin and a few locals who get together for cycling, beer and tomfoolery. We thought it sounded like us. Little did I know I would need a full working body and not my mama-chari trained body. I'm amazed that these guys can ride 55km, stop for smoke breaks and school me on the hills. At the least, it was great to get out and experience Japanese countryside with the leaves in full color. We saw cranes, temples, shrines and gorgeous Japanese maples. It was a "wow, I'm in Japan," event. James's mustache handlebars come in handy on the train. In the station, a friendly Japanese fellow stopped James and I, whipped out a camera and asked to take our picture because he loves bicycles (and probably blondes, too). What to do with a day off in the middle of the week? Tokyo Disney! For only 5,800 yen, you too can spend all day with Mickey-san. Kat and I relished in our childhood dreams and enjoyed people watching on Thursday. So close to Halloween, visitors were encouraged to wear their favorite Disney costume (but if you wore a Pixar costume, you might be kicked out---ever so politely, of course!). The Harajuku crowd left Meiji park and found their way to Disneyland to show off their cosplay. It made people watching even more fun. James couldn't be bothered with the 90 minute lines for Space Mountain and the Jungle Cruise to join us. Tim Burton's Haunted Mansion--the coolest of all rides, so well done it made you feel like you were in the movie. I'm not happy with the hat selection---apparently Asian fans of Disney embrace the new, and not the traditional personalized Mickey ears. Couldn't find one pair of regular Mickey ears in the whole park! Great costume...or is it really a costume? Hard to tell. Kat throwin' the peace sign at ya. Such a Japanese scene. We chased this Cinderella around trying to get her picture as she moved away. Imposter! School children in a line going into the park. Most Japanese children do wear these uniforms everyday---knee socks, school girl skirt and sailor shirt. Feeling a little city weary, we tried to get out all weekend. Our first attempt to go to Nikko failed miserably (no places to stay, missed trains while we were standing on the platform! ), so we ended up with a hike on Sunday. Mt. Takao-san is just about an hour from town by train, but still considered part of Tokyo. The air was crisp and clean in the mountains and the leaves were just beginning to change. IT was really beautiful. The mountain is a spiritual place for Buddhists---the highlight of my day was seeing a Buddhist monk taking his leashed pig on a stroll. Apparently there are monkeys all around, but we didn't see any. Do you think the monkey's are mad? Don't know what these little guys represent, but they are cute and everywhere. Fuji is off in the distance. Little Buddhas around the temple. When this guy stretched out he was over a foot long---we couldn't believe how much he moved like a snake. A man wearing a sick mask rang Jesse's doorbell at 4:30 a.m. In a culture where public displays of affection are taboo, we saw a couple sitting on a bench on a busy street, sitting bolt upright, with one breast out while they made out. 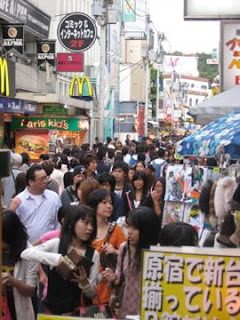 Harajuku is the home to the Tokyo teen craze Cos-Play. Girls dress like dolls, goth or Little Bo Peep. Boys dress up in mismatch baggy clothes, trucker hats and anything that is the latest craze. They hang out at the edge of Meiji Park and Shrine and sing, dance and just oggle each other. Tourists oggle with their cameras, too (we are no exception). 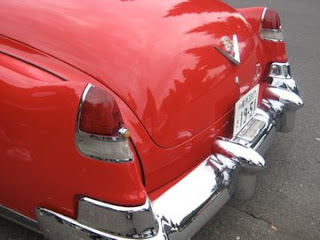 This Sunday it seemed that all things 50's is the latest craze. The park had multiple groups singing and dancing to Grease and even a group of regulars who dress like Kenickie and the Burger Palace boys, with sky high sculpted hair that the do in the park as part of the spectacle. 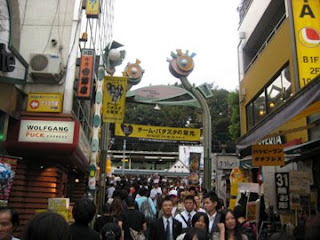 Takeshita Street is crammed with stores to buy costumes, 8 inch platform shoes and $90 t-shirts. After a day with the shopping masses, we joined 20,000 more people at the Radiohead concert at Saitama Super Arena. The Japanese fans are so polite and subdued, if I were Radiohead I wouldn't have come back for that lackluster encore request. Only problem is the cord is in the bathroom. He looks right at home, though. Here's my class this year. I have 16 girls from mostly Asia and Europe. All girls is a unique dynamic that I'm still getting used to. You would expect them to be little angels....but these girls can talk! In this picture we had just finished making o-nigiri, a sort of Japanese sandwich that is rice and some sort of filling (tuna, umeboshi, salmon, roe) wrapped up in nori. We eat them often because they are yummy and cheap. Got a door that just won't stay open? Afro Boy can get the job done!